Please refer to our stock # MOR6578 when inquiring. Koma Inu Shrine guardians decorate this unusually vivid Ako carpet dating from the early 20th century. The color combination is quite striking, especially when held up to the more standard subdued works typical of Ako. It is 95 x 195 cm (37-1/2 x 77 inches) and is in stunning condition. We found this wrapped in paper in the attic of a Kyoto home which had been sealed off during renovations in the 1950s. 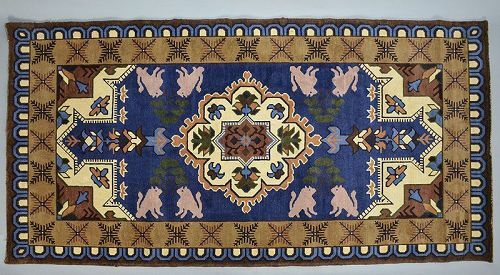 With a relatively small quantity produced within the rather short history of Japanese carpet making, this is a great collector piece as well as functional antique carpet with very soft texture and attractive design. Called ‘dantsu’ in Japanese, hand knotted rugs are works of art requiring several months to complete. Inspired in her travels by Chinese benrekisen rugs, Naka Kojima spent years developing the looms and began weaving carpets in Ako in 1874 using high quality cotton, traditional designs and her own innovative weaving techniques. It became a cottage industry in Ako, handed down for decades among the local women while men worked the salt fields. At the peak of its popularity, they adorned the Imperial House of Japan and other governmental buildings and were exported to Australia, the UK, and the US. However, challenges in the world market during the great depression the prohibition of cotton trade leading up to World War II forced not simply a decline, but a near closure of the industry. Some resumed weaving after the war, but found it difficult to compete with machine-manufacturing. In 1991, with the support of Ako City, weaving classes for younger women taught by Kirie Sakaguchi,the only Ako Dantsu weaver left in the city, were begun and since there has been some revival albeit on a very small scale.